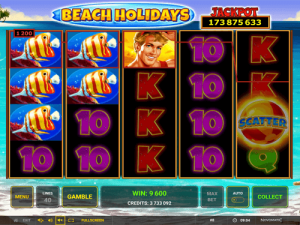 Beach Holidays is a tropical-tastic slot from Novomatic. It has five reels, forty paylines and a jackpot big enough to fund a seriously dreamy beach holiday! The beach holiday is seen as the ultimate way to relax! But there’s nothing remotely relaxing about going to an overcrowded beach by bus and listening to people’s screaming children! Planet earth has some absolutely stunning beaches. Koh Phi Phi in Thailand is one of the world’s most famous. French Polynesia is home to some idyllic stretches of sand and clear, turquoise seas. Just close your eyes and dream of Bora Bora, Aruba, St. Lucia, the Bahamas and Bali. Picture yourself lying on a sun lounger, drinking cocktails and cooling off in the sea. What could be more wonderful? This new Novomatic casino jackpot game could make your beach holiday dreams come true! If you win the massive jackpot, you’ll be financing the beach holiday of a lifetime! You only need to load this slot to see what beauty could be awaiting you! You’ll see this lovely coast at sunset. Purples, pinks, reds and oranges dominate the design. The sky has a fiery glow from the setting sun and the water is a lovely purple colour. In the distance you can see palm trees on the other end of the sandy beach. Beach Holidays has built-in gamble and autoplay features. You can win up to 18 Free Games in this jackpot game! When you think of a beach, what comes into your head? The sun, sea, sun loungers, towels, cocktails, sunglasses and attractive people in swimsuits? Well, this game has it all! To represent the theme, this Novomatic casino slot has loads of beachy symbols. There’s the coconut cocktail, the ice-cream sundae, the seagull, the tropical fish, the beautiful woman and the handsome lifeguard. Both the woman and the lifeguard are very tanned! Although there’s lots of coastal culture in this slot game, it’s also a slot game! That’s why there are also casino-style symbols and traditional slot symbols, including Scatters, Wilds and high-card value symbols. 10, Jack and Queen give the smallest payouts. King and Ace pay more. Then, the payouts increase in this order: the cocktail and the ice-cream sundae; the bird and the fish; the beautiful woman; the handsome lifeguard (Wild) and the Scatter. The Scatter is the most valuable symbol in the entire game and can pay up to 100x your bet! Aside from the beautiful woman symbol, all symbols award payouts when 3, 4 or 5 matching symbols land on winning positions! The beautiful woman gives a payout for 2 matches as well. The 40 paylines run from left to right and the matching symbols only pay when they land on a line. The paylines pay one way and only for consecutive combinations (matches that land on neighbouring reels). The most exciting thing about playing a jackpot slot game is that you never know when it might drop! Any player can be the lucky winner of the enormous Beach Holidays jackpot. It’s not just any old jackpot – it’s a progressive jackpot! A progressive jackpot just keeps on getting bigger and bigger, until someone wins it! You can only win the jackpot during the bonus feature. The bonus features is 18 Free Spins with double wins! You get these free spins when you land 3, 4 or 5 Scatter symbols on the reels. It doesn’t matter where the Scatter symbols land, they can land anywhere and still pay! The bonus feature can be retriggered the same way at the bonus featuter wil be retriggered by other Novomatic slots, if you spin another 3 or more Scatter symbols. During the bonus feature, you might win the Beach Holidays jackpot on any free spin! If the reels stop showing 20x lifeguard symbols. That’s a lifeguard on every position in the game.